We haven’t heard much from Canon for awhile in spite of the launch of the Panasonic AF100 and Sony FS100. Many have wondered if Canon will ever release their own large sensor true video camera. 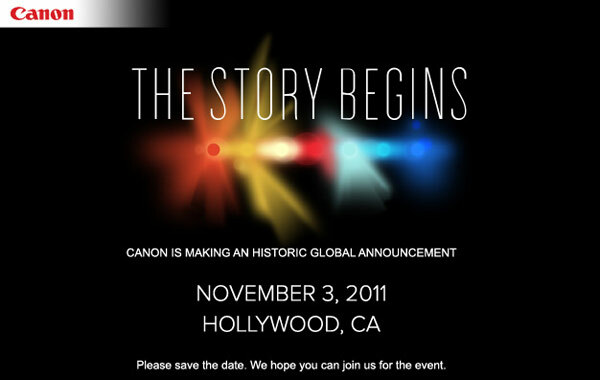 Late last month, Canon sent out a cryptic notice about a special event at which they would make a historic announcement that will change the face of Hollywood. It is obvious that Hollywood has adopted Canon HDSLR cameras for certain shoots, but it has always been used as a special tool and not a primary form of capture. For Canon to make a camera that will change Hollywood, they would need to up their game quite a bit. Rumors are flying around that we may see two different camera options from Canon, similar to Sony’s line up with the high end F3 and lower end FS100. Canon’s options would likely include a high end PL mount camera to compete with the Sony F3 and RED One. It is probable that this camera would be between $10K-$20K and might record up to 4K resolution. The other option would be a lower end EF mount camera to compete with the Sony FS100 and Pansonic AF100. One major advantage that a Canon EF mount video camera would have would be the integration of Canon’s wide library of lenses. Many people who use the FS100 and AF100 use Canon glass with special adapters which are rare and limiting. Being able to use your Canon lenses directly on the camera body and theoretically control your aperture and focus would give the Canon EF camera a huge edge. Of course this is all rumors and speculations. Until the November 3rd event, we won’t know anything. But, if you are in the market for a large sensor camera, you may want to hold off for a month to see what Canon has up their sleeve. No sooner do I post this article then new information gets shared online. Looks like new cameras aren’t the only things on Canon’s mind. Jon Fauer reports that Canon just announced the opening of the Canon Hollywood Professional Technology and Support Center right in Hollywood. Whether or not this news will coincide with an announcement of new cameras from Canon on November’s special event is anyone’s guess at this point.